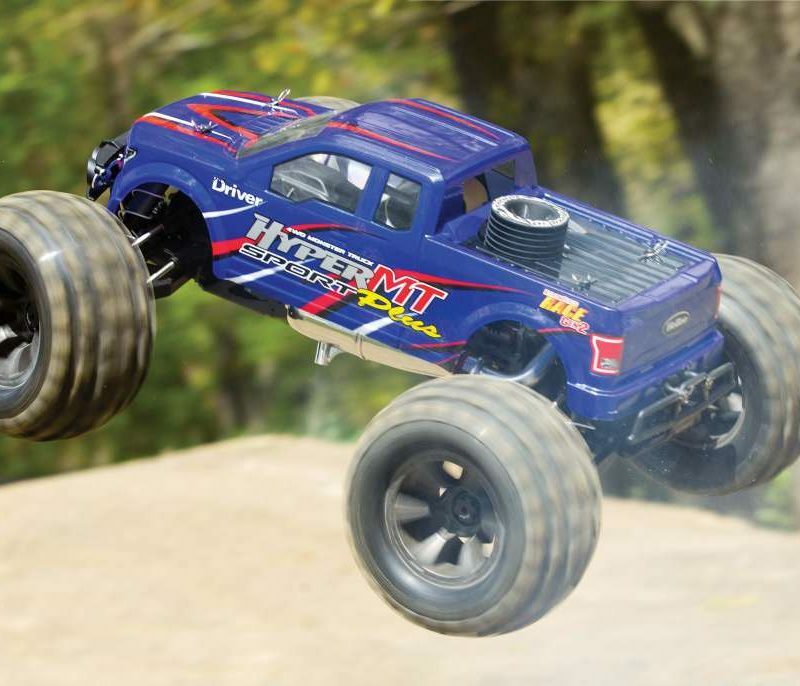 It’s no secret that Team Associated fans all over have been eagerly awaiting a new 1/8 competition off-road buggy from the multiple World and National title holding manufacturer. The versions of the RC8 up until now have enjoyed a lot of success, but the design began to limit what could be done and taking the platform to the next level was uncertain – at least in the eyes of armchair engineers. Well luckily the crew in Area 51 decided to start from the ground up for a new 1/8 release and the long-awaited RC8B3 is finally here. I can already hear what some are saying, including that the buggy looks like one vehicle or another already on the racing scene. In fact I had that initial concern, too, and even on a trip to Team Associated itself, the guys behind the important desks saw it on my face. But in all actuality, we’re reaching the point in RC vehicle evolution where we’ll be seeing a lot of cues taken from successful machines. The question remains, who will take what works and make it better? That’s exactly what AE did! They found what works for the majority of racers on a wide variety of tracks, designed a buggy around it and refined the design to be better performing, more durable and easier to use. 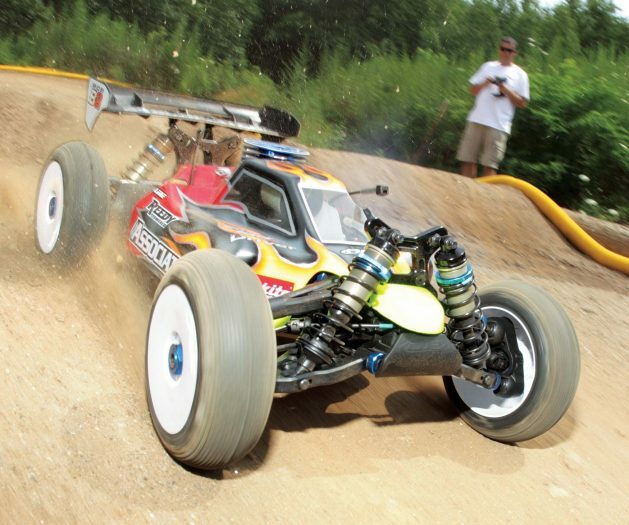 The concept sounds good, read on to see for yourself what makes the RC8B3 a must-have buggy for the track. • Material around universal joints seems thin. Could this be a concern for long-term wear? 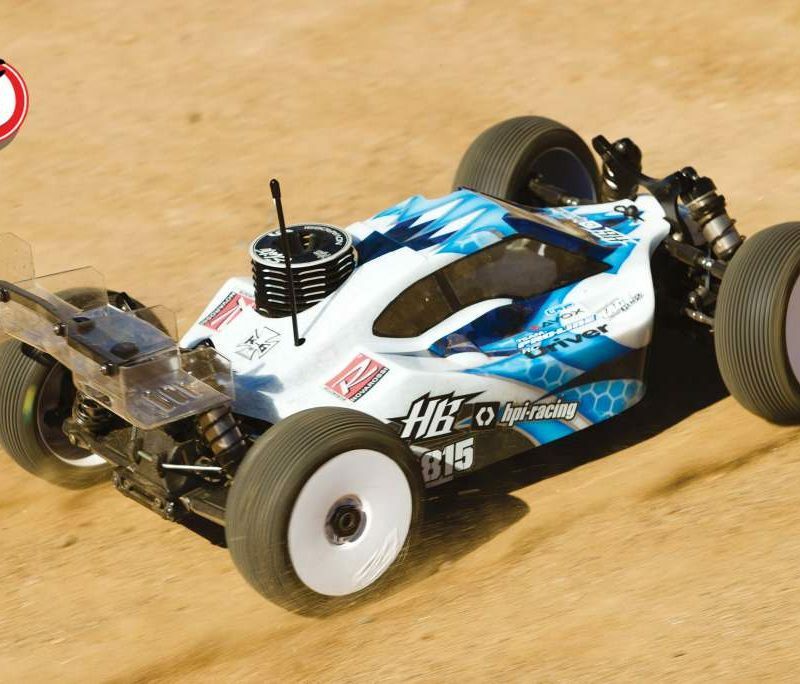 If I had to pick a favorite class in RC racing it would be 1/8 nitro buggies so I tend to really study every part and design feature in a vehicle. 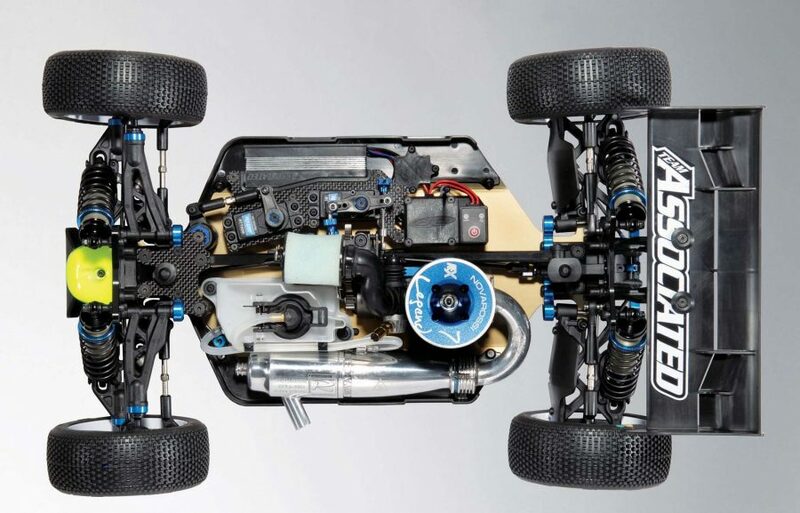 It appears Team Associated went to town in the details department on the RC8B3 and created an awesome buggy in box stock form… and it amazed me with its performance on the track. Do you need one, AE fans? Simply put; hellz to the yeah! In past reviews of the RC8 platform offerings we told you what varied from vehicle to vehicle, but here we have to start from scratch because the RC8B3 shares just about nothing with its predecessors. The 3mm thick, hard anodized aluminum chassis features a narrow cut under the transmission with large wings coming out for the droop screws to hit. The center section is a nearly rectangular shape with angled edges to increase strength. Just two cut-outs allow flywheel and spur gear clearance while the engine mounting screw locations are slotted and recessed to allow mesh adjustments. On the top side, composite braces steady up the front and rear of the vehicle and low profile mud guards bolt to both sides to keep debris off the components. Since it’s a race machine, it needs carbon fiber and AE did not disappoint; the radio plate and front upper plate are beautifully machined from the sturdy material. 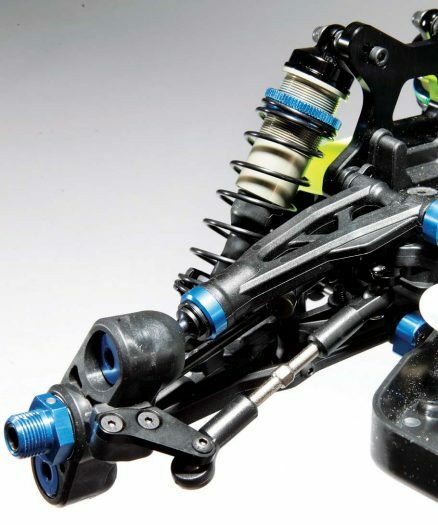 Team Associated went in a whole new direction with the suspension in comparison to its predecessor; the RC8B3 features a pivot ball with uprights set-up on the front end. 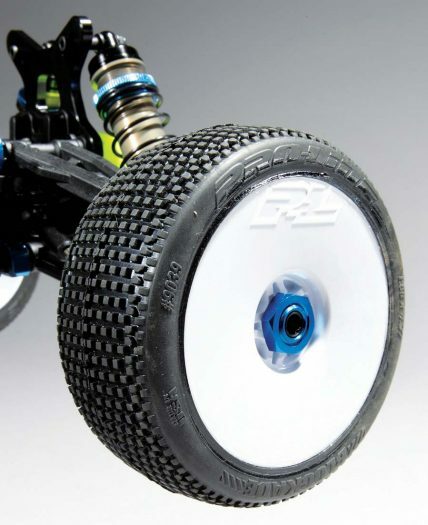 Pivot ball suspension isn’t new to the RC industry and has been used on more vehicles than I who have been in the RC hobby for over thirty years, can think of so enough with the copycat comments, web warriors. The pivot ball front end proved to be the most nimble for a wide range of drivers according to AE’s testing and they utilized its design so more drivers can enjoy success behind the wheel. The arms seem tough, so tough I had to use a power drill with hex bit to screw the pivot balls into the arms. Aluminum caps slip over the arms to prevent the pivot balls from splitting the arm in a crash. The pivot balls are steel and the uprights are a hefty composite with steering arms that bolt on with optional arms soon to come. The rear arms, like the front, are hefty and feature plenty of bracing. There are two shock mounting locations on the arms for ease of tuning and dirt shields for the rear arms are included to deflect debris. Aluminum pivot blocks are supplied for all five block locations and several parts trees loaded with various inserts let you tune your RC8B3 to track conditions. There are plenty of roll adjustment options and the thick rear turnbuckles allow easy, precise, camber tuning. Now we can move on to the shocks, these massive 16mm bore oil-filled, coil-over aluminum shocks feel oh-so- smooth and AE stuffed 3.5mm shafts in the dampers for maximum durability without the thickness of the shaft effecting the displacement in the shock when it cycles. The shocks bolt to thick, machined aluminum towers. 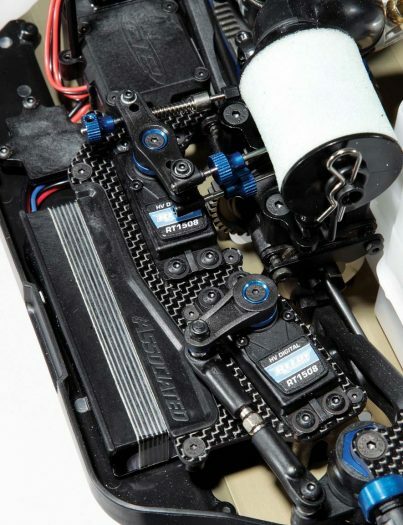 For steering, I’ve seen Team Associated try a number of revisions of steering types over the years, but here they’ve gone with the tried and true bell crank setup with servo saver on the main crank and an aluminum drag link bar with adjustable Ackermann positions connecting the two. The steering is loaded with bearings for smooth operation and the servo saver spring collar is a clamping type collar so it won’t back off while you’re racing hard. AE includes servo horns with metal inserts, which are less likely to strip in a crash, to mate up with your specific servo. The driveline is where you can find some pretty neat features, starting with the lightweight diffs and outdrives to keep rotating weight down. The diffs are sealed and oil-filled with Lucas Oil provided from the factory to fill all three. The universals are a thin driveshaft to again reduce weight on the front, center and rear. What is interesting in the driveline is that AE chose a dual shield bearing, rubber for the dirt side and metal for the inner sides so the bearings have less drag. The bearings also have a smaller diameter than what we’re used to seeing but they are a flanged type bearing for better strength in most locations. To slow the buggy, machined steel discs are clamped by bonded pads with springs to help separate the brakes when you roll off the binders. Getting power from the engine to the flywheel is an aluminum three-shoe clutch with three aluminum shoes that spin the included steel clutchbell. I like AE’s easy-to-install clutch spring design. 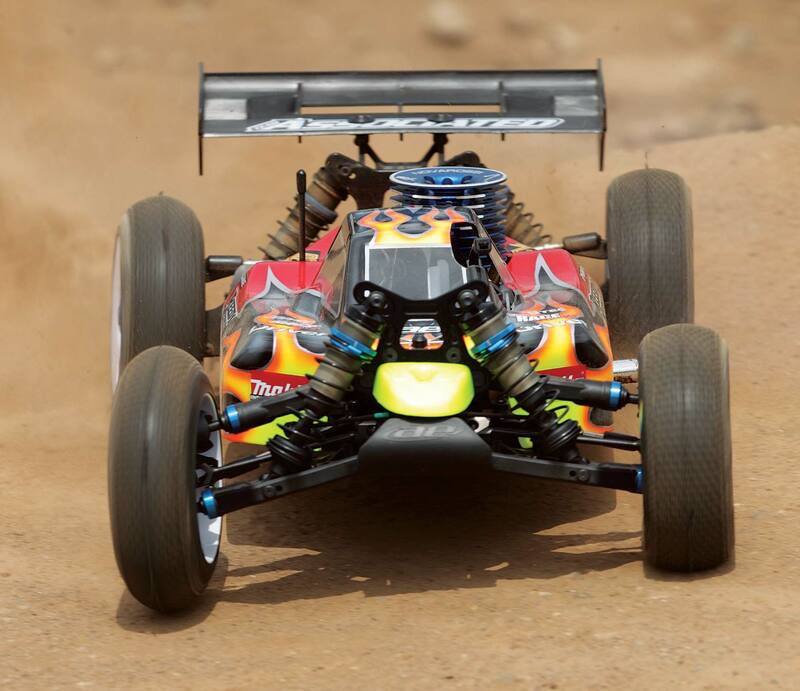 Topping off the buggy is a Pro-Line Racing cab-forward, clear, Phantom body that hugs the chassis yet gives plenty of clearance for the internal parts with a forward cab to give the buggy downforce. Associated includes two wing mounts, one high and one low, to alter rear downforce. Mounting to the top of the wing stands is a double deck wing with curved upper deck and large, flat, lower deck. 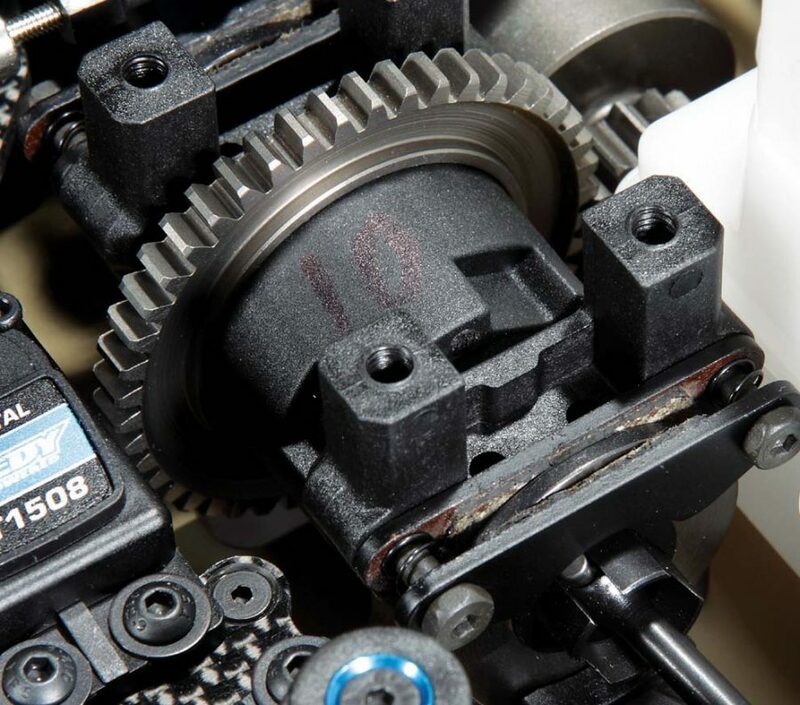 Let’s talk additional neat features like the smaller differentials with easy access gearcases that allow easier, quicker diff pulls for maintenance or tuning. The swaybars are another neat feature in that they are held in place by a swing-away plate and centered with a single collar located on the center of the bar. Then there’s the lower shock mount pin rather than a screw that could possibly back out. 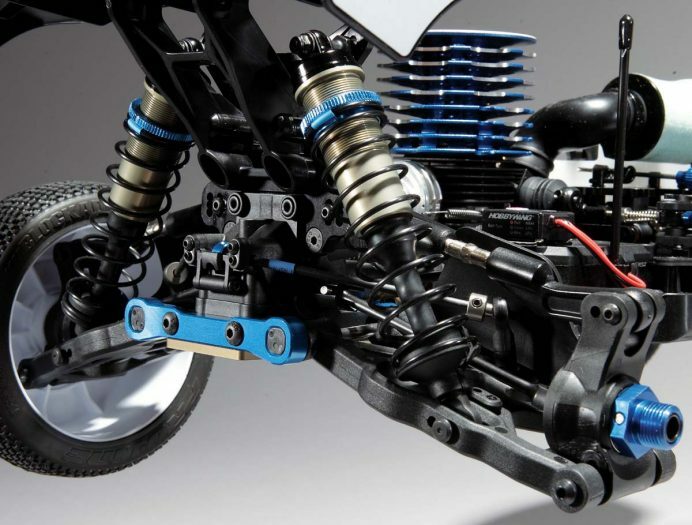 The throttle linkage features steel bushings so the arms move freely and the linkages are easy to adjust with thumb nuts. Over on the tank, the clunk style tank has walls to catch spilt fuel and guide it down a spill hole the empties out of the bottom of the chassis. Next to the tank you’ll see the inline barrel filter that makes finding foam filter elements so much easier at your local shop. To wrap this up, let’s talk quickly about the build. Our kit was fairly uneventful to build and I mean that in a good way. Just about everything fit together just fine. You should keep each of your differentials dry and complete before adding oil to make sure you need the number of shims suggested. The diffs should have a slight drag feel when building them but not too notchy or loose. Once you determine they are built correctly, fill them up. The quality was almost perfect with everything else with the exception that one linkage collar didn’t have any threads, just a fluke on my kit, most likely. Finally, my last tip is to be extremely careful when threading the stop screws into the front uprights. You do not want to cross thread the screws or you won’t be able to tighten the screws all the way. JUMPING/ HANDLING: On the bench, the shock setup felt a bit on the heavy side so I was curious to see how it played out on the track. My trusty sidekick Tony Phalen and I headed off to Wolcott Hobby & Raceway for a day of testing. I rolled out the RC8B3 on the track and started out easy, getting a feel for the handling and then with a few laps under my belt I started to push the buggy. The buggy has somewhat of a dead feel and that’s a good thing as when you land or hit bumps and ruts the buggy stays in line or lands with a plush, in-control feel. The buggy, although built to be light in many respects, is not overly light to the point where it feels out of control. The balance feels just right so many drivers should feel at ease pushing it hard. The buggy skis off the big jumps, is controllable as you would expect in the air and typically lands slightly nose-down for the spinning front wheels to pull it through landings. Through the ruts the buggy felt so stable, not bucking through the ruts of the blown out sections. The few times I did land the buggy less than perfectly, it was easy to regain control and keep motoring on. STEERING: Back to that bench test, the buggy has gobs of steering so I really wanted to see how well it would do on the track. The off-power steering is amazing, the weight forward setup helps plant the front wheels, the inner wheel on the corner has a ton of throw and its caster helps dig the tire in to carve the corner while the outer tires push it through the turn. There is some rotation from the rear of the car with the way the diffs are setup to further enhance how well the buggy corners. 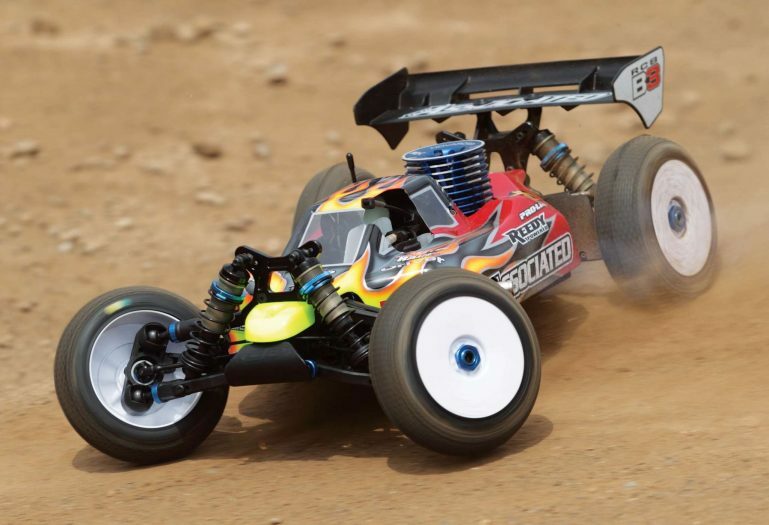 At higher speeds, those front wheels digging in and the rotation still get the RC8B3 quickly through the larger corners and this buggy is so much fun to blast through big sweeping turns. 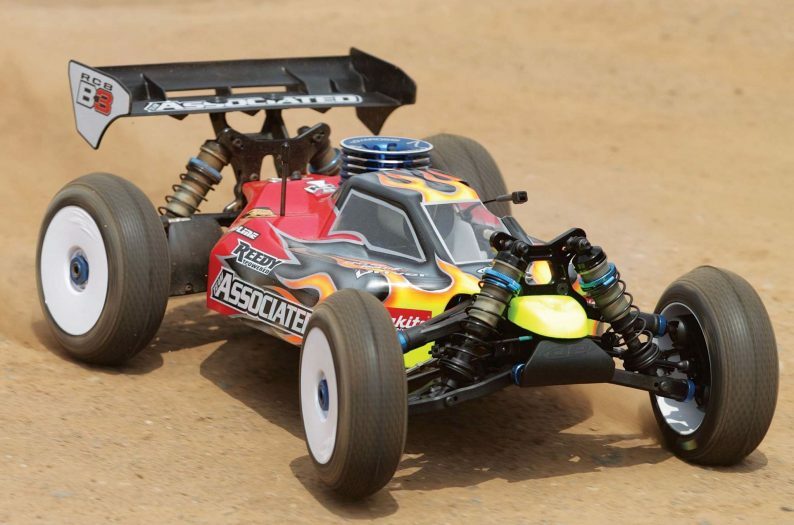 ACCELERATION/ BRAKING: With the RC8B3’s lightweight driveline and a potent REX Legend 7 engine bolted to the chassis I thought the power this buggy was going to lay down would be intense and it was. The buggy has a lot of punch and with the stock setup and my choice of Pro- Line Blockade tires, there was plenty of traction and minimal wheel spin. The traction resulted in amazing acceleration on the straight and an easy time running the car up short chutes. The snappy acceleration also helped me tweak the car in the air and rip out of the tight 180-degree corners on the track. But just as impressive was the braking, which I set up with a bit more rear brake bias. The RC8B3 feels stable under braking and can easily slow up the buggy at the end of straights without issue. My favorite part of running on the test track was actually during a hard braking corner with a bump on the entry. I could come at the bump hard, crank the wheel, stab the brake and the buggy would slide up, over and around the bump and was setup to rip down the next shoot. DURABILITY/ EASE OF USE: Although my test report may sound like I was a pro driver laying down laps at the Nats, I was less than perfect. I had my fair share of cartwheels after hitting some jumps wrong and plenty of meet-ups with the pipes in the corners. Luckily nothing broke. I did read early rumor reports that there were arm and axle issues with the buggy on pro team test cars, but AE fixed them before production cars hit and my test buggy didn’t have any issues. But what I love on this car is its ease of use, the layout is nice and clean and easy to work on. The diffs are easy to get to, there are plenty of tuning adjustments, even two wing mounts are supplied, one high and one low so tuning the wing height is fixed and easy to swap without the worry of wing mount parts falling off in a race. Team Associated really did pay attention to all the details a driver wants when they want to hit the track competitively. 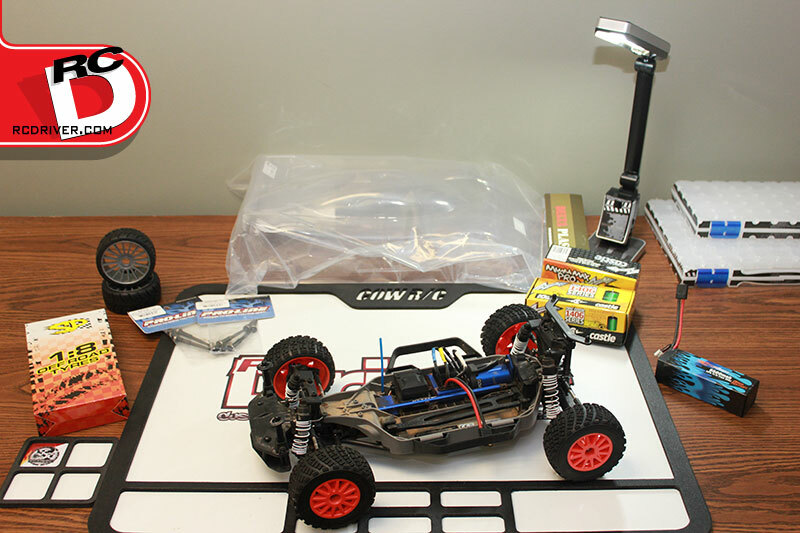 Since the kit does not come with wheels and tires, we outfitted our test buggy with Pro-Line Blockades on Pro- Line rims. The front pivot ball suspension offers incredible steering throw and the tie-rod end links are swept to clear the front wheels at full lock. To adjust camber, Associated provides thin shims to place behind the upper pivot ball to change the degree. AE’s radio tray requires the battery pack to be taped to the front battery plate to put more weight toward the front end. There is an external transponder mount and the radio box uses four screws to access the receiver. Neat little rubber strips are provided for where the wires enter the box to cut down on dust getting in and to prevent the wires from chaffing. Big, bulky, rear hubs are held in place with a locking-nut retained hinge pin. The large bore shocks feature tall wall spring perches so they can’t accidentally pop off in a tumble. A look at the center diff shows the heavy duty spur, composite diff supports and the steel brake discs with padded caliper plates for consistent braking. WEIGHT: 7 lb., 6 oz. Team Associated has been receiving criticism across the board from good to bad on the internet over the design of their new 1/8 offering. Many judgments are coming from drivers who haven’t even touched a car, that’s why you’ve turned to the professionals at RC Driver for our opinion. 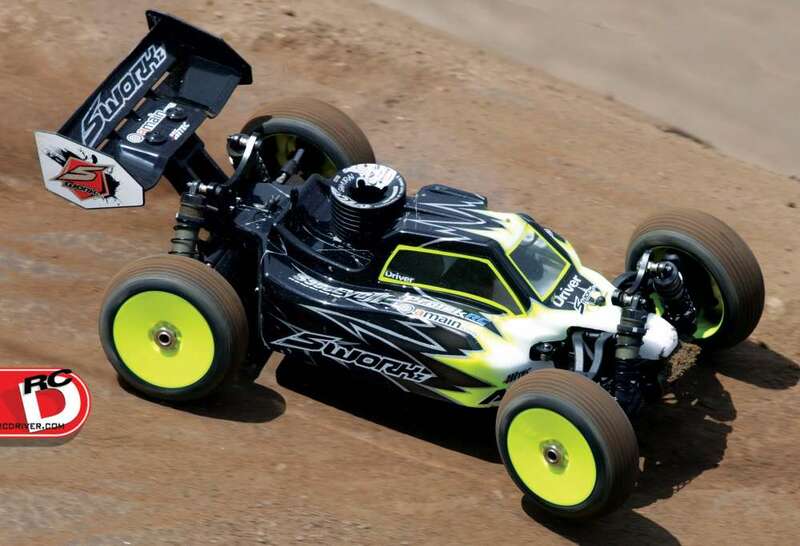 Well here it is, we’re more than happy with what Team Associated has come up with to replace their previous buggy. This buggy works, seriously it works for many different drivers and a wide range of tracks. 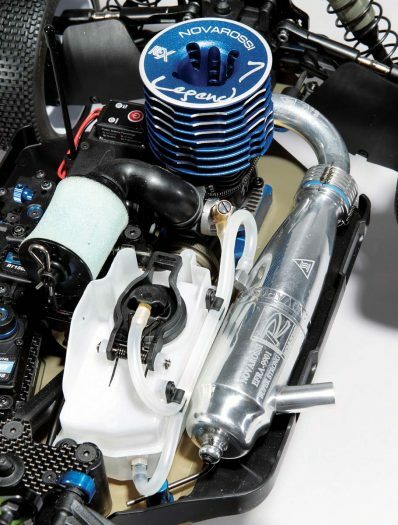 Details like arm caps, flanged bearings, included aluminum hinge pin mounts, barrel filter, optional wing mounts and the inclusion of a body from an aftermarket manufacturer among many other things clearly shows AE set out to impress. The buggy emits all the right performance traits on the track and racers of all levels are sure to hit the track with success behind the wheel of an RC8B3.